RelaxMe is a unique double action formula which works on both the gut and the nervous system. 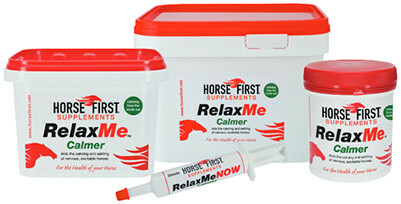 RelaxMe combines magnesium, vitamin E and B group vitamins to create a calmer more easy-going horse. With RelaxMe the secret is in the loading, so when feeding for the first time give a loading serving, two to four 25g scoops for the first 5-10 days morning and evening until the desired effect is obtained. Then cut back to maintenance level, usually one 25g scoop per day, then before competition or stressful situation increase to loading level for 3 feeds before event. With RelaxMe you will learn what's best for your horse. Ideal for all horses and ponies. * Horses that display any signs of anxiety or stress. * Horses that become over-excited in competition. * Horses that find it difficult to concentrate. * Horses that are being schooled and in training. Loading: Add two to four 25g scoops to morning and evening feed for 5-10 days.